In this week’s parsha, Toldot, Rivka executes a plan. Rivka, we know already from last week, to be a deeply caring, dynamic, and decisive woman. The Torah describes her kindness to Eliezer and his camels with a quick succession of verbs indicating Rivka’s resourcefulness, enthusiasm, and generosity of spirit. A determined woman willing to stand behind her convictions, Rivka unfalteringly expresses to Lavan and Betuel her desire to return with Eliezer and marry Yitzchak. It is therefore not surprising that in the beginning of this week’s parsha, Rivka beseeches God on her own rather than rely on the advocacy of her husband. It is also not surprising that she quickly forms an opinion regarding which child she prefers and feels should receive the covenantal blessing. However, even Rivka struggles and questions. Before her children were ever born she attuned uncannily to the struggle between Yaakov and Esav. But she could not figure out what it meant. Even after she sought out an answer by inquiring with a local prophet, the answer given to her, according to many commentators, remained unclear. Moreover, Rivka’s failure to confront Yitzchak directly about her convictions regarding Yaakov seems a further reflection of her own hesitations. The Ramban argues that Rivka saw how much Yitzchak loved Esav, and she felt she could not trust him to make the right decision if she confronted him directly. Instead Rivka tries to execute her plan stealthily. She has Yaakov dress up and pretend to be Esav; she pulls the strings from behind to ensure that what she believes to be right will happen. Why didn’t she just tell Yitzchak what she thought was right and have a direct and honest conversation? Why didn’t she express herself with the conviction she had? In addition, to what the Ramban’s point of not trusting Yitzchak would listen, perhaps Rivka felt conflicted and unsure whether it was her role or appropriate to push Yitzchak and raise her voice on this matter. There have been strong-willed, intelligent, proactive women from the beginning of time, but what the best ways to make use of those skills are, in the home, the community and beyond -– those are questions that women are still asking today. We need to welcome discussions on these issues from both men and women in our community. The movie 93 Queen tells the inspiring journey of a group of women who struggled with these questions and pushed to create space for themselves and create change in their community. The Young Israel of North Woodmere (634 Hungry Harbor Rd., in North Woodmere) will be screening the film at 8 pm this Motza’ei Shabbat. Men and women are invited to join us for the movie, and to help us continue the conversation about women and their roles – in the Jewish community and beyond. Particularly as religious women, we tend to think that it is a religious value to be agreeable, to be accommodating, and not to raise our voices on matters of public policy. I personally feel that those are societal expectations rather than religious mandates, and yet I struggle with deciding when to raise my voice and how. I struggle with what is my role as a religious woman, and can I really “do it all”. I am privileged to know in my personal and professional life many exceptional women. We are all asking these questions. We are trying to be who we are, not hide it, to have our yiddishkeit enhance our engagement with the world and to have our engagement with the world enhance our yiddishkeit. 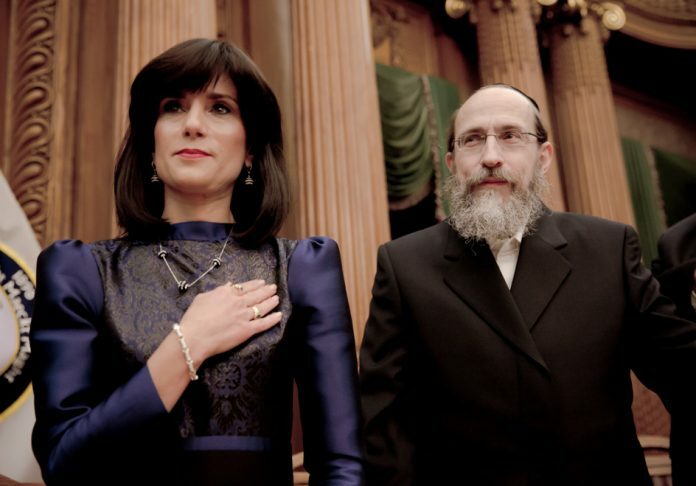 Rebbetzin Lisa Septimus is the Yoetzet Halacha of the Five Towns and Yoetzet Halacha of Great Neck Synagogue. A graduate of Yeshiva University’s Graduate Program for Advanced Talmudic Studies, she subsequently served as the program’s shoelet u’meishiva. She teaches Talmud, Chumash, and Ethics at North Shore Hebrew Academy High School in Great Neck. In her active role as rebbetzin at the Young Israel of North Woodmere, she is integrally involved with adult education.